Powers/Abilities: Poundcakes was granted cybernetic enhancements by Roxxon's subsidiary, Brand, and subsequently superhuman strength (Class 25) and durability from the Power Broker. She is also trained in battle with her “Seismic Boots”, which enable her to create earth tremors that are sufficient to overturn a small automobile. History: (Official Handbook of the Marvel Universe Master Edition#10) - Marian was born in Garden City, New Jersey. (Thunderbolts I#21 (fb) ) - At some point, Marian was imprisoned for extortion. There, she met Screaming Mimi and invited her to join the Grapplers. (Official Handbook of the Marvel Universe Deluxe Edition#5: Grapplers) - Poundcakes, Screaming Mimi, Letha and Titania became protégés of Auntie Freeze. They became famous wrestlers, but despite Auntie Freeze's promotion, they didn't earn as much money as their male counterparts. A Roxxon operative saw them wrestle and offered them the chance at some extra money. (Thunderbolts I#21 (fb) / All-New Official Handbook of the Marvel Universe#9: Roxxon) - At some point, along with the other Grapplers, Poundcakes received cybernetic enhancements from Roxxon's subsidiary, Brand. (Marvel Two-in-One#54) - In a wrestling match, Thundra defeated Poundcakes, followed by her teammates as they attempted to assist her. (Marvel Two-in-One#56) - The Grapplers, along with Thundra, infiltrated Project: PEGASUS. After they finished the mission Thundra thought they were sent on, Poundcakes and the others took off and split up.Poundcakes and Titania ran into Giant-Man, but Poundcakes makes quick work of him by throwing him into a vapor-tube. He managed to escape, but the pair of women assault him again, with Poundcakes stomping on his foot. With the last of his strength, Giant-Man grabbed the two women and smashed them together, knocking them unconscious. (Dazzler#13 - BTS) - After their mission with Thundra, the Grapplers were imprisoned at Ryker’s Island. They made the best of their time in prison by ruling the women’s wing with an iron fist, with Titania as the leader. (Dazzler#13) - Three Grapplers (Poundcakes, Letha, and Screaming Mimi) entered Dazzler’s room at night while in prison and brought her to Titania. They planned to punish her for supposedly killing the villain Klaw, and ruthlessly beat her. 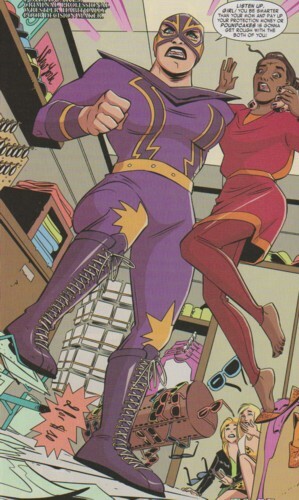 Poundcakes especially got some hits in on her, but Dazzler eventually fought back and knocked all of the Grapplers out by using Screaming Mimi’s voice against them. (Marvel Two-in-One#96) - Having somehow escaped prison, the Grapplers waited outside the hospital the Thing was a patient in until the appropriate time to attack. However, Captain America intervened, and defeated Poundcakes with his shield. He then defeated the others, but they soon recuperated.Fortunately for him, the X-Men showed up and held off the Grapplers. Later, Poundcakes and the other Grapplers joined a super-villain army on their way to attack the Thing, and they participated in the battle against several superheroes. (Thing I#33 - BTS) - Some time after their stint with villainy, the Grapplers became assimilated into the Unlimited Class Wrestling Federation, and they were completely willing to give up a life of crime for a higher paying (legal) gig as wrestlers. 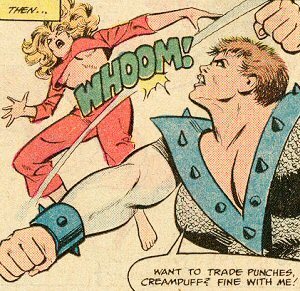 (Thing I#33) - After Titania’s loss against Battleaxe, Poundcakes scolded her for being a sore loser.When Titania was murdered, Poundcakes was one of the many women who immediately accused the Thing, leading to all of the women piling on top of him.However, it was then revealed that Battleaxe was with the Thing the entire time, so he couldn't have killed her. (Thing I#36) - Poundcakes participated in the battle against the Thing and Ms. Marvel (Sharon Ventura) after their raiding of the Power Broker's headquarters.She, along with Mangler, defeated the Thing with their combined assault. (Captain America I#371) - Poundcakes got upset when Jackhammer flirted with her in public. She began stomping the ground, causing a commotion. To prevent them from disturbing a date between Diamondback and Captain America, Anaconda dragged both of them into a vehicle, where the Asp knocked them both unconscious. (Captain America I#389 (fb) - BTS) - Poundcakes was recruited to the S.S. Superia, presumably by MODAM or one of Superia's other lieutenants. (Captain America I#389) - Aboard the S.S. Superia, a cruise ship full of super-villainesses, Poundcakes attended the Pageant of Power.She also joined in the battle against Captain America and the Paladin as the women discovered them. (Captain America I#390) - Alongside Frenzy, Pink Pearl, and Titania (McPherran), Poundcakes grabbed one of Paladin's limb and threatened to rip him apart if Captain America did not comply with the Femizon’s wishes. (Captain America I#391) - Poundcakes was seen with the rest of the Femizons as Superia introduced herself. (Captain America I#411) - Poundcakes attended the AIM Weapon Expo, where Crossbones fought five foes (Mad Dog and Ramrod came first) in a prearranged match. (USAgent II#1 - BTS) - U.S.Agent was given a mission to stop Poundcakes, who had been selling mind-controlling alien bugs to various buyers, most notably Atlantean renegade forces. 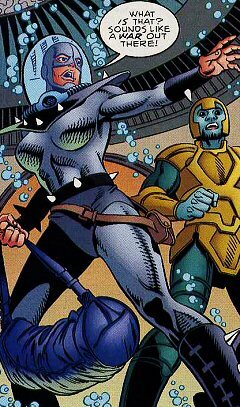 (USAgent II#2) - Deep undersea, Poundcakes finished off her deal with the Atlanteans, and refused to help them in their battle when they asked her.She got back to her escape ship and took off, but not before USAgent caught up to her. She was able to hold him off with her boots, and made it to the surface. There, a boat waited for her to escape, but Agent Kali Vries caught her. After a struggle, Poundcakes kicked her off the boat. USAgent, who finally caught up, attempted to apprehend Poundcakes.A helicopter showed up, and Poundcakes gave him the ultimatum of chasing after her or stopping the boat from crashing into helpless civilians on the quickly approaching beach.USAgent opted to steer to safety while Poundcakes escaped. (USAgent II#2 - BTS) - After Poundcakes escaped from USAgent, she and her pilot were quickly defeated by the Avengers, and taken into custody. (Avengers/JLA#4) - Poundcakes was seen battling Big Sir. (Amazing Spider-Man I#562) - Poundcakes was among several other villains in the Bar With No Name. Poundcakes placed bets with the Bookie that Spider-Man will never have seen the video the Basher had created. She, with the others, watched the fake Spider-Man (Screwball in disguise) defeat the Basher. (Amazing Spider-Man I#563) - Poundcakes participated in the bar room brawl with Spider-Man, and later refused to reveal information about the Bookie. (Amazing Spider-Man I#600) - At the Bar With No Name, Poundcakes was among the villains ambushed by Spider-Man and Daredevil. During the battle, Spider-Man kicked a pool table at Poundcakes. She later escaped with the others when the authorities showed up. (Women of Marvel#2/2 (fb) - BTS) - Letha, Lascivious and Poundcakes reunited as the Grapplers and took in runaway Lanie as the new Screaming Mimi, outfitting her with the same technology Melissa Gold originally used. They had their new Mimi to contact Melissa Gold, who was now the heroine Songbird. (Women of Marvel#2/2) - The three villainesses offered Songbird to rejoin them for a bank robbery, but Songbird denied their offer. They sent the new Mimi against her, but Songbird defeated the Grapplers, holding them in check with her light constructs, and took off Mimi's technology, telling her to go back home, which she did. Songbird handed over Letha, Lascivious and Poundcakes to the police. (Thunderbolts I#159/2 (fb) - BTS) - Poundcakes ended up in the Raft. (Thunderbolts I#159/2) - When Juggernaut's transformation into Kuurth destroyed the Raft Poundcakes was among the women that attempted to escape. Their power-dampening leader Indali, who constantly annoyed Marian, who didn't want to be called Poundcakes anymore, helped them overpower Thunderbolts member Moonstone. Forcing Moonstone to bring them to the teleporting Man-Thing the women ran into male prisoners and a fight broke out. Poundcakes choked out Indali to give Moonstone her powers back. With Moonstone's help the women defeated the men and Marian and the other women decided to follow Moonstone because escape from the Raft was impossible at this point. (A+X#12/1) - Titania brought Letha and Poundcakes to a bar to meet up with Wonder Man and Beast. Poundcakes hit on Beast, who could barely fend off her aggressive advances. (Unstoppable Wasp#3 - BTS) - Working for an unidentified boss Poundcakes and Letha collected money for their boss' protection racket. (Unstoppable Wasp#3) - Poundcakes attacked Vandana Aggarwaal at her store near Times Square. She demanded the protection money she owed to her boss, but she wouldn't pay up. When Vandana's genius daughter Priya entered the shop with Nadia, Poundcakes told her not to be as stubborn as her mother and just pay up before she had to rough them up. (Unstoppable Wasp#4) - Nadia talked Poundcakes out of hurting Vandana Aggarwaal by being nice to her. Poundcakes explained how she and her partner Letha were once a great tag-team in wrestling until she was arrested and now real wrestlers like her weren't what promoters were looking for anymore, which forced her and Letha to work for criminals. When Letha barged in with Jarvis to tell Poundcakes that their cover had been blown and Jarvis asked Nadia to call in the other Avengers, Poundcakes felt betrayed by Nadia and attacked her. Nadia shrunk down, put on her Wasp costume and got into a fight with Poundcakes, whom she knocked out by throwing her own helmet at Poundcakes' head. After Wasp knocked out Letha, Poundcakes charged at her with a baseball bat, but Wasp blocked the baseball bat, raked Poundcakes eyes, broke her nose, shattered her knee and then knocked her out with a kick to the head. (Unstoppable Wasp#4 - BTS) - Poundcakes and Letha were arrested and sent to the Superhuman Temporary Holding Facility in Queens, New York. (Unstoppable Wasp#8) - Janet Van Dyne, Nadia and Yin visited Feliciano and Pouncy at the Superhuman Temporary Holding Facility in Queens, New York. Pouncy was afraid she would never be able to wrestle without a knee brace after the injury Nadia inflicted upon her. Nadia apologized to them for hurting them, which was the first time someone ever apologized to Pouncy for hitting her. Janet then offered both of them contracts with Pym Labs. She explained the Aggarwaals had agreed to drop their charges against Pouncy and Feliciano if they agreed to work for Pym Labs as the personal security of Nadia's G.I.R.L.S. group. In addition to a generous salary as Pym Labs employees Janet offered the duo sponsorship for their wrestling careers and personal redesigns of their costumes and branding by herself. (Unstoppable Wasp#8 - BTS) - Feliciano and Pouncy presumably took the offer to get out of prison and work for Pym Labs. Comments: Created by Mark Gruenwald & Ralph Macchio (writers), John Byrne (penciller), Joe Sinnott (inker). Poundcakes is the only member of the original Grapplers who isn’t dead or reformed. USAgent II#1-2 botched Poundcakes' name all sorts of crazy. They’d call her “Marion Pouncey” and then “Marian Pouncy” (the correct spelling) all on the same page. Poundcakes seems to be Marvel’s answer to DC’s Stompa, of the Female Furies. In fact, the original incarnation of the Grapplers are very reminiscent of the Furies: Titania would be Big Barda, Letha would be Lashina, and Screaming Mimi would be Mad Harriet. It makes me wonder why they didn’t amalgamate them when they merged Titania (MacPherran, mind you) and Big Barda into Big Titania in Bullets and Bracelets#1. The only handbook entry Poundcakes ever received of her own was in the Master Edition. Fortunately, it gives some generic background such as her birthplace and that she graduated high school. Unfortunately, it gives no background history to her at all. Others present in the Bar With No Name in Amazing Spider-Man I#562-563 were: Coachwhip Condor, Discus, Dr. Nemesis, Enforcers (Fancy Dan, Montana, Ox), Fer-de-Lance, Hydro-Man, Powderkeg, Puff Adder, Ramrod, Rattler, Rock Python, Scorpia, Squid, Stiletto & Trapster. Updates by Markus Raymond (Women of Marvel, Unstoppable Wasp). anyone else with a similar name.